It is remarkable, time and again, and again, how well the RARSUS partnership has emerged. For our latest research stay, hands-on attitudes were quite clearly put to the fore. Importance of physical encounter are generally appreciated by everyone since they enable better understanding and accelerate progress at all levels. During our stay in Niamey, from 21 January – 8 February 2019, Prof. Adamou from Abdou Moumouni University Niamey (UAM) facilitated an absolutely successfully and pleasant stay for us. 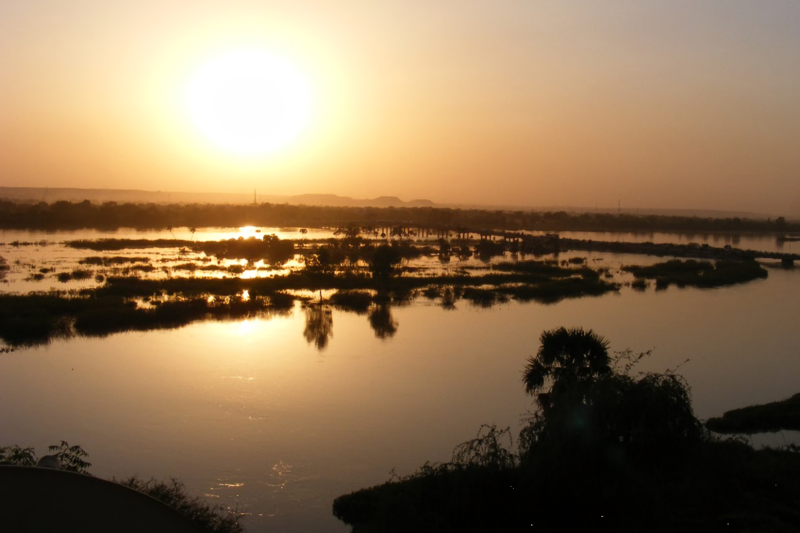 Wonderful sunset over the river, The Niger River brings life to the whole city and renders the plains along its banks fertile for cultivation. Aiming to achieve the overall project objective to find strategies for improved sustainable urban resources supply, my colleague Khalid and me are focusing on energy options and their associated risks. We set out to meet our colleagues in person, get direct access to on-ground data and gather valuable experience that will enrich future research. In Niamey, we are engaged in a perfect study environment for some obvious reasons. The region has very diverse and abundant energy resources while simultaneously being particularly vulnerable to a number of external as well as internal factors. From an operational perspective, excellent interdisciplinary academic research, as well as university infrastructure are in place. The energy sources in the region, fossil as well as of renewables are off the scale. However, it will take an extraordinary effort to utilize them. Most importantly, it will be imperative to find ways to harness and use that energy in an innovative way that helps as many people as possible. Recapitulatory, it has been an amazing experience coming to haunt me and seeing what Niamey is like. The people of Niamey are so friendly they have been incredibly hospitable to us. I particularly want to thank Moussa Moukaila and Hassane Adamou. These two people arranged interviews with local stakeholders, organized and accompanied events, and helped to acquire valuable materials. In all they provided indispensable support during our stay. They have really helped us to see what is going on in the city, and it is incredible. It has been a fantastic experience to be here, if you get the chance to come, grab it, it is a brilliant place to visit in my view.